After being a close game throughout, UT ended the last 44 seconds of the game on a 9-0 run, which was capped off by Grant Williams driving to the paint and finding Admiral Schofield in the corner for a game-sealing 3-pointer. The dynamic duo of Schofield and Williams has been one that has fueled Tennessee all season. This week, they were both tabbed to the late season top 20 watch list for the 2019 John R. Wooden Award Player of the Year. Florida (12-10, 4-5 SEC) is coming off one of the toughest two-week stretches in the entire league, with games vs. Ole Miss, vs. Kentucky, at Auburn and then capped with a trip to Thompson-Boling Arena. Standing as one of the league’s best defensive teams, the Gators allow a league-best 63.4 points per game while also holding opponents to 41-percent shooting from the floor. Florida has held eight opponents to fewer than 60 points this season, including Arkansas, Stanford and West Virginia. Extend Tennessee’s program-record win streak to 18 games. That would also be the longest win streak of Rick Barnes‘ 32-year head coaching career. Stretch the Vols’ home win streak to 22 games, dating to last season (it is the longest home win streak of the Barnes era). Make the Vols 7-1 all-time as the AP’s top-ranked team. Extend Tennessee’s win streak in regular-season SEC games to a program-record 14 games. Tennessee’s average home attendance of 18,318 ranks fourth nationally. This is Rick Barnes‘ longest win streak as a head coach. He led Texas to a 17-0 start to open the 2009-10 season. At tipoff Tuesday, 77 full days will have elapsed since Tennessee’s last loss. Noah Locke (11.4 ppg, .421 3FG%) is the team’s other double-digit scorer. The freshman guard is far and away Florida’s most dangerous 3-point shooter, with nearly double the amount of threes as any other Gator. Of his field goals this year, 74 percent (61 of 82) have come from beyond the arc. Standing as one of the league’s best defensive teams, the Gators allow a league-best 63.4 points per game while also holding opponents to 41-percent shooting from the floor. Florida has held eight opponents to fewer than 60 points this season, including Arkansas, Stanford and West Virginia. A drive by Grant Williams followed by a dish to Admiral Schofield for a 3-pointer in the corner was the final blow that gave No. 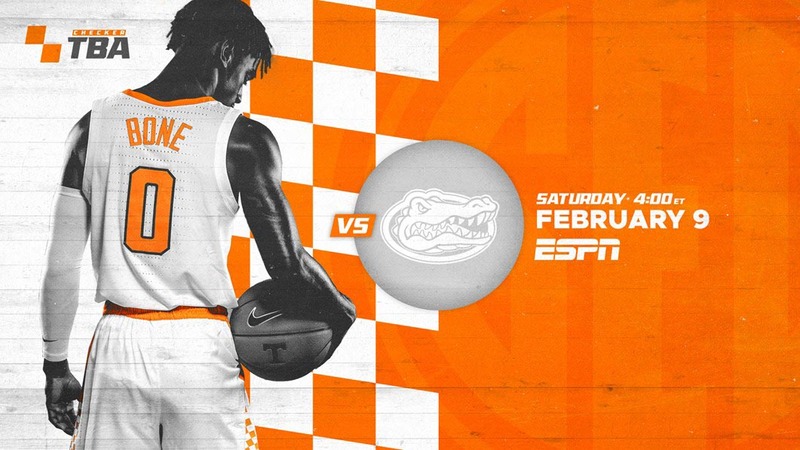 3 Tennessee a hard-fought road win at Florida on January 12th, 2019. The Vols defeated the Gators, 78-67, in Exactech Arena. After being a close game throughout, the Vols ended the last 44 seconds of the game on a 9-0 run to clinch the 11-point victory. Late in the game, Tennessee was able to thwart the Gators’ offense. Florida was held without a field goal over the last 3:35 of the game and scored just four points in the final six minutes of play. Williams finished with a game-high 20 points while also leading Tennessee with nine rebounds. After a 3-pointer by Florida’s KeVaughn Allen made it a 41-35 Gators lead at the 19:08 mark, Tennessee responded with a 15-4 run, which was capped by a one-handed slam from Williams that forced Florida to call a timeout with 14:04 left. The Allen three was one of just seven made baskets for Florida in the second half, as Tennessee held them to 28 percent shooting. For the game, the Florida offense shot just 35.2 percent from the field. After having just three points at the midway point, Jordan Bowden helped put Tennessee in front in the second half, scoring 12 consecutive points for the Vols over a 1:49 stretch in the second half. His effort put the team back in front for good with 5:36 to play in the game, as he broke loose on a fast break and threw it down with a right-hand jam. Bowden finished the game with 17 points, going 6-of-7 from the free-throw line, and led Tennessee with two steals. Jordan Bone tallied a team-high five assists and added eight points and five rebounds. The legendary Bernard King recorded the third-best scoring performance in school history with a 43-point, 20-rebound effort as the Vols topped the Gators 93-84 on January 17th, 1976, in Stokely Athletics Center. During the 1983-84 season, Willie Burton averaged 16.7 points, 9.3 rebounds, 2.0 assists and shot .500 (17-of-34) from the floor against the Gators. UT was 3-0 vs. Florida that season. Dane Bradshaw’s breakaway layup with 20.1 seconds to play proved to be the winning basket as the Vols upset second-ranked Florida 80-76 in Knoxville on January 21st, 2006. The Vols upset fifth-ranked Florida 86-76 on Senior Day in Knoxville behind Chris Lofton’s 21 points on February 27th, 2007. ESPN College GameDay broadcast live from Rocky Top, Peyton Manning addressed the Vols in the locker room before the game, and Pat Summitt donned cheerleader garb and led the sold-out crowd in a rendition of Rocky Top during a media timeout. Tennessee is riding a program-record 17-game win streak. Tennessee’s 21-game home win streak is the second-longest active streak in Division I. Houston has won 31 straight at home; Buffalo, like UT, has won 21 straight.